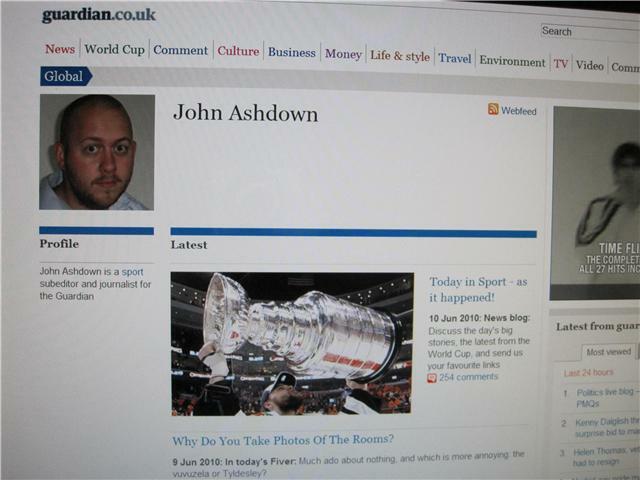 John Ashdown is a burglar. He is in fact part of a sophisticated team of burglars who operate from a Kings Cross hideout in London village. John and his pals use their cunning skills to rob of our time everyday. How many times during your working day have you tried to shield your pc from your boss because instead of rolling the Yen you're sneaking a look at the sports pages on the Guardian website? "Everything is hunky dory, Japan can sleep tight" I say to the aforementioned boss whilst trying not to scratch my nose or blink. These lies are for a good reason though. Ashdown has got a shoe in each of the following delights; The knowledge, Today In Sport, The Fiver (of course The Fiver), daily transfer gossip and a plethora of other gubbins and, furthermore, the whole Jewson lot is bloody marvellous. Here is a little tip for you chaps at The Guardian that you might want to think about covering: the World Cup in South Africa 2010 - starts today. If you take that on board, what are they likely to have you doing for it? They've already brought out the manacles. We've got reports, blogs, live coverage, podcasts, videos, tweets and news galore. Personally, I'll be concentrating on perfecting my pretending-to-work-while-surreptitiously-watching-the-football schtick. Likewise John, likewise. What's your favourite World Cup memory? David Platt's goal against Belgium in 1990 'in the last minute of extra time'. Nine years old. In the White Hart (with my dad, I should add). Way past my bedtime. And one of the most criminally-underrated goals in World Cup history. Magic. Do you think En-ger-land will win it? 'Fraid not. Quarters, probably. Semis, possibly. I have a sneaking suspicion it'll be Holland's year. Enough of the World Cup already. You've given EFW some welcome coverage on the Guardian pages. Are there any other football blogs that tickle the Ashdown fancy? Twohundredpercent is a fantastic site, one that gives plenty of exposure to the little guys of the football world. Their series on Chester during the winter was exceptional. One other I have a real soft spot for is Tony kempster - a stats site keeping track of scores, tables and attendances right the way down the league pyramid. If you want to know how many came through the turnstiles for Pease Pottage Village v St Francis Rangers in the Sussex League Division Two in the 2004-05 season (and, let's face it, who doesn't), it's there (35, by the way). It was run by the eponymous Tony until he died last year (almost exactly a year ago now) and now stands almost as a memorial, like a stopped clock. How did you end up at Guardian Towers? Same old story, I'm afraid - not what you know but who you know. A university lecturer helped me bag two weeks work in the summer of 2002. That turned into a month. Then the season. I'm still clinging on. Clinging on and going great guns but it's 2010 and you're not on Twitter Mr Ashdown. Time to get down with the kids no? It's bit poor isn't it? I tend to use it quite a bit (@badjournalism is a particular favourite) so I'm beginning to feel like a Twitter leech (or Tweech, if you like) - taking what I want out of it without putting anything in. I'm sure I'll be on there soon, though the thought of Barry Glendenning 'following' me is slightly unsettling. The Knowledge on the Guardian website is a thing of rare beauty. Are there any cunning or inane questions and answers that stand out? My favourites tend to fall into two categories. There are the deep research ones - an afternoon with my head stuck in old Rothmans or Guardian archive pages is something close to my idea of nirvana. Of that ilk the recent question on the pointlessness of taking three goalkeepers to a World Cup is a perfect example - it's not something I've ever seen anywhere else and it was an excuse to spend all day looking at every single World Cup line-up since 1930. The other category of great questions are the ones where you get fantastic anecdotes or info from readers. Have any football matches been captured on Google Earth? Well, yes they have. From which train trip in Britain can you see the most league football grounds? This one, actually. You just couldn't do those questions without an army of trivia-loving readers pitching in. And occasionally you get emails out of leftfield that really make your day. The one from David White's dad, for example. Genius, surely there is a book in that isn't there? Why, yes there is! Available in all good bookshops etc and so forth. My Knowledge colleague James Dart put it together so he scoops all the vast royalties. Stinker. Who is the biggest football anorak at The Guardian? Smyth. Without question. Though I did once out-anorak him at a football-based quiz by knowing that Edgeley Park is the closest ground to the Mersey and recognising a bearded early-80s Martin Jol. Has anyone ever disagreed with Jonathan Wilson on a 'football tactics' issue or do you all just agree with everything he says and then pass it off as your own thoughts down the pub? I find it rarely pays to disagree with Jonathan about anything. He seems to know pretty much everything about about pretty much everything. We once spent a four-hour train journey from London to Sunderland together and he regaled me with stories of the various features of the north-east coast as we went past, pointing out of the window at some 14th century castles and revealing who lived there, what they used to have for their tea and what their dog was called. When I went to Amsterdam for a weekend last year he recommended the Indonesian rijsttafel. Now I'm a bit of a gourmand, but I'd never heard of it - turns out it's ruddy amazing. So in the face of such knowledge I'd never dream of questioning him on tactics, and, yes, in the right company (ie people who haven't read much of Wilson's stuff) dropping 'Actually I reckon the full-back is the most important player on the pitch' into a conversation can make it sound like you know what you're talking about. Rather embarrassingly Mr Fuller from The Ball is Round and I got locked inside Wembley Stadium a few weeks back. You've got previous in this department have you not? Alas, yes. It's happened twice, with varying degrees of embarrassment. Basically on both occasions the shoddy broadband at Loftus Road and Hillsborough meant I had to pop back to the press box to file match reports rather than utilise the press lounge. And on both occasions, I returned to the press lounge to find doors locked and lights going off. At Loftus Road I accidentally scared my other half by ringing her and saying I was 'stuck in the ground'. She thought I'd fallen down a hole. After wandering round the pitch I managed to get out through the players' tunnel. That wasn't an option at Hillsborough - it was locked for a start, but I'd also left my keys in my bag in the press lounge. I don't really want to go into the unedifying details. Suffice to say they include increasingly frantic banging on a door, increasingly loud and colourful swearing, and, eventually, rescue from a understandably nervous looking local journalist. You like your cricket as well. Would you prefer an afternoon at Lords watching England rip through the Aussie card or a seat at the World Cup QF watching England unexpectedly overcome Portugal on penalties? I'd have to say Lord's. I'm not an England-hater, but I do find it increasingly hard to get behind the national side. Too many dislikable characters. That said, even when I was a kid I'd have taken a Sheffield United FA Cup win over an England World Cup victory. My wife wouldn't agree but I don't actually digest that much football media during the week. The thing I do make a point of listening to each week though is the Football Weekly Podcasts. Are they as much fun to record as they are to listen to? Probably more. It's far more shambolic than you'd ever imagine having downloaded from iTunes, which is a testament to the skills of Producers Pete and Ben. That sitting around chatting to such footballing brains as Raf Honigstein, AC Jimbo and others is an occasional part of my job is a real privilege. Do you have a favourite James Richardson pun? There was that one about Sharon Stone and Nicklas Bendtner. But as we don't have the option of bleeping it out, it probably can't be repeated here. How do you think Football Weekly differs from TheGame podcast and The Football Ramble? I suppose on a spectrum of seriousness, if you had the Game at one end and the Football Ramble at the other, we'd be floating in the middle. I imagine if you like football and enjoy podcasts you probably subscribe to all three. I certainly used to, though it's just FW and the Ramble for me these days. I don't suppose you all queue up to do those minute by minute reports do you? They're wonderful to read but no so good for repetitive strain injuries I'm guessing? I genuinely always enjoy doing them, although it's very difficult to get a proper impression of the match because you're always watching them out of the corner of your eye. And, yes, they do make you yearn for a touch-typing class. How much sport do you watch a week? Not as much as you might think. When you work in a sport environment all day it's nice to get away from it when you leave the office. For example, I'm currently listening to a Radio 4 report on krill. That said, it's probably still far too much. Tee hee, thanks a million for talking to EFW John and keep up the good work old chap. Cheers. It's been a pleasure. So there you have it folks, John Ashdown is not only a top man (see above) but, he won't mind me telling you that he recently cemented his 'football guru' status by predicting Blackpool would be relegated from the Championship last season, Oh. I'm off to get a train from Plymouth to Aberdeen, 11-and-a-half hour journey that takes in 20 (twenty) league grounds in case you didn't click on the link earlier. £180 well spent and no mistake. Read up on John's work at The Guardian HERE. To get tip-top satirical daily football email The Fiver delivered to your inbox click THERE and you'd be an absolute radish if you didn't download the Football Weekly podcast - again for free - HERE each week. Another Cracking Article Mate Top Banana!! Im Real Glad For The Mention For The Late Tony Kempster As That Site That Was Obviously A Labor Of Love Is Amazing And Still Used A Lot By Myself And Others! Thanks Big Dave and yes, hats off to John for bigging up Tony Kempster. Tony was the unsung hero British football fans and his site was, and still is, a rare thing of beauty. RIP Tony Kempster.